The introduction of the new computerised system for MoT testing has thrown up a problem which, it appears, affects the vast majority of commercial Land Rovers (but not Station Wagons). I just took a 1963 2A 109 petrol to my local MOT station. They now have the new computerised testing system which they did not have last time. They input the chassis number into the system and then informed me that they could not carry out the MOT. Reason given was that the vehicle has a revenue weight of 3499kg gross, and must therefore undergo a class 7 MOT test (commercial vehicles 3000 - 3499kg GRW) which most MOT stations are not equipped for. I was given a computerised printout which showed the reason for rejection as 'Vehicle details entered incorrectly at test registration - wrong class vehicle'. Now the 'revenue weight' should be the maximum gross laden weight (GLW) as given by the manufacturer, and a figure of 3499kg, for most Land Rovers, is just plain wrong. It looks as though DVLA have been using 3499kg as the default revenue weight on Land Rover V5s for a very long time. Apart from the shortage of class 7 testing stations, the test costs more than a class 4 test. So I did a bit more research. 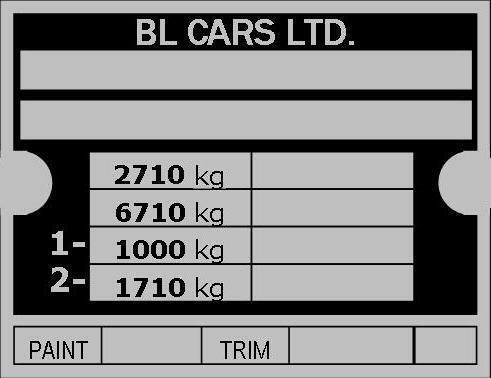 The first figure (2710kg in this case) is the GLW, which you should use as the revenue weight. For Series 3 before 1979, the GLW is given in the handbook as 2120kg for 88 inch vehicles, 2710kg for 109 inch (except the very rare One Ton model). I do not have figures for earlier vehicles. So if you send your logbook away in plenty of time before the next MoT is due, and get the revenue weight changed to something less than 3000kg, there is no problem, your vehicle will definitely be tested as class 4, just like a car. But that doesn't help you if you have a 110 or 130 (GLW over 3000kg) or your MoT is imminent. (b) satisfies the following conditions as to construction: (i) is permanently fitted with a rigid roof, with or without a sliding panel; (ii) the area to the rear of the driver's seat must: · be permanently fitted with at least one row of transverse seats (fixed or folding) for two or more passengers, and those seats must be properly sprung or cushioned and provided with upholstered backrests, attached either to the seats or to a side or the floor of the vehicle; and · be lit on each side and at the rear by a window or windows of glass or other transparent material having an aggregate area of not less than 1,850cm2 on each side and not less than 770cm2 at the rear; (iii) the distance between the rearmost part of the steering wheel and the backrests of the row of transverse seats satisfying the requirements specified in the first paragraph of item (b) (ii) (or, if there is more than one such row of seats, the distance between the rearmost part of the steering wheel and the backrests of the rearmost such row) must, when the seats are ready for use, be not less than one third of the distance between the rearmost part of the steering wheel and the rearmost part of the floor of the vehicle. Almost all Land Rovers are covered by section (a) above. If you have a 130 crew cab, you may find the ULW is over 2040kg, but you should still be able to get the vehicle tested Class 4 under section (b) above, as a crew cab has permanent transverse seats and side windows. So if a tester tells you your Landie needs to be tested class 7, you can now quote the 6th edition MOT testing guide at him chapter and verse. BUT: the dual purpose exemption is to be withdrawn at the end of 2009. From the start of 2010, if a vehicle has a recorded GLW of 3000kg or greater, it WILL be subject to class VII test with no exemptions. If you own a 110 without self-levelling suspension, a 130 or a Forward Control, you will just have to live with this and find yourself a Class VII MoT station. For everyone else, if the revenue weight on your V5 is wrong, get it changed now. And if your chassis plate has gone missing, get another one made up. For vehicles first used on or after 1st August 1980, the VIN number (chassis number) must be displayed on the vehicle. Land Rovers had the number stamped on a plate (Click here for more info) and also stamped into the right hand front chassis leg, but the latter may have been replaced or patched over on older vehicles, and if you have no VIN on the vehicle, the tester can and will refuse to test it. Even a pre-1980 vehicle with no chassis plate may lead to major grief at MoT time, although the tester cannot strictly refuse to test it.